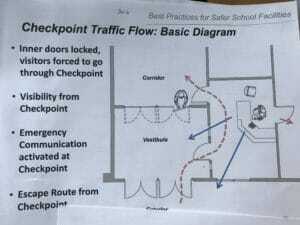 School Lockdown Door Security Device Options: How to make classroom doors more secure and school doors safer. 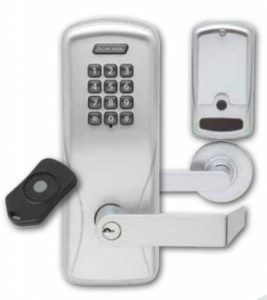 MECHANICAL OR ELECTRONIC locks -either WORK with key, fob, and/or card credential! EXISTING DOORS AND FRAMES- steel, reinforced, frames and commercial grade doors and locks windows not to exceed 12″ with extra glazing film or protective grate. VESTIBULES- another layer of security-custom fabricated steel – two sets of doors creates A locked chamber that should direct visitors through the office with a buzz in. Retrofit available to convert classroom function to classroom security function for both ND and L series schlage locks. 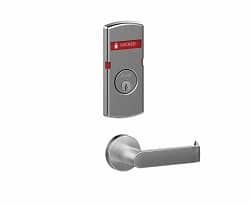 Schlage L 9071 classroom security function lock. 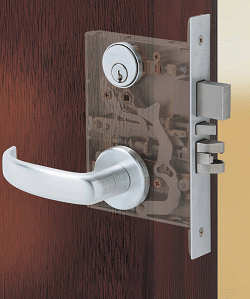 Classroom Security Lock – credential from inside or outside. Always free for immediate egress. Keypad, Proximity reader, fob, card, mag stripe available. No interior locked classroom door has ever been kicked in or breached by an active shooter. Beware of salesmen selling cave-man technology school door barricades that break the law and violate NFPA 80 fire codes and Life Safety 101, along with ADA non compliance. These school door barricades are a liability problem for schools and could cause unintended and very dangerous consequences if a predator used them. Staff and first responders may not be able to get into a classroom. These low voltage school door sensors alert school administration to unauthorized open egress doors on the perimeter of a building envelope. Panic buttons can not only alert law enforcement of an emergency, but can also be used to lockdown school doors using electrified door hardware. 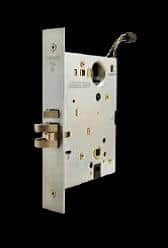 We integrate electrified HES door strikes or Schlage door locks with existing IT Network school platforms. 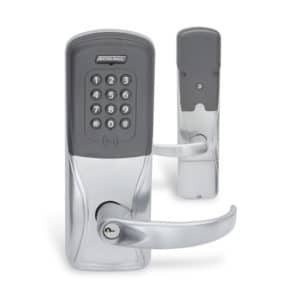 We also help train staff on stand alone and programmable electronic locks like Schlage CO220 classroom security locks. We keep your school keying records, help you set up a system and are authorized to duplicate Schlage Primus & Everest High Security keys. Our certified fire door inspector can do a full maintenance check on all of your doors to ensure they are all up to code. 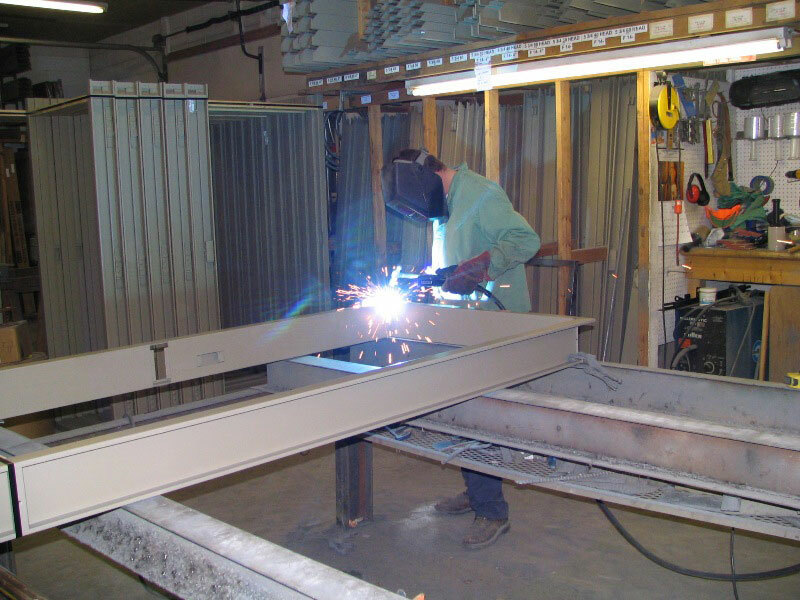 We can fabricate your custom designed secondary school entrance or added vestibule to direct visitors through specific doorways for another added layer of door security. 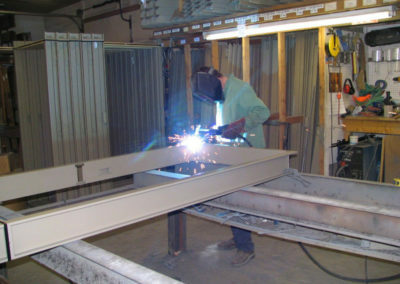 We build from Architectural Specifications – custom school entry doorways, and front entrance systems for schools. 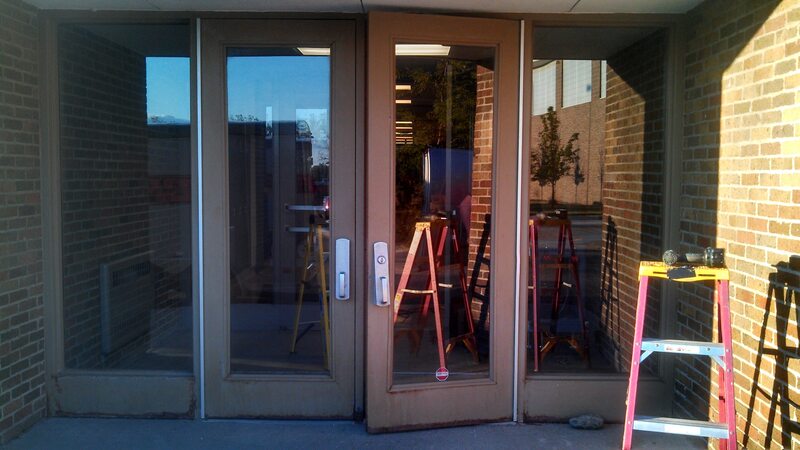 We remove old doors with full glass and replace, install new safer and more secure school entrance door systems. Old School door removal and replacement. 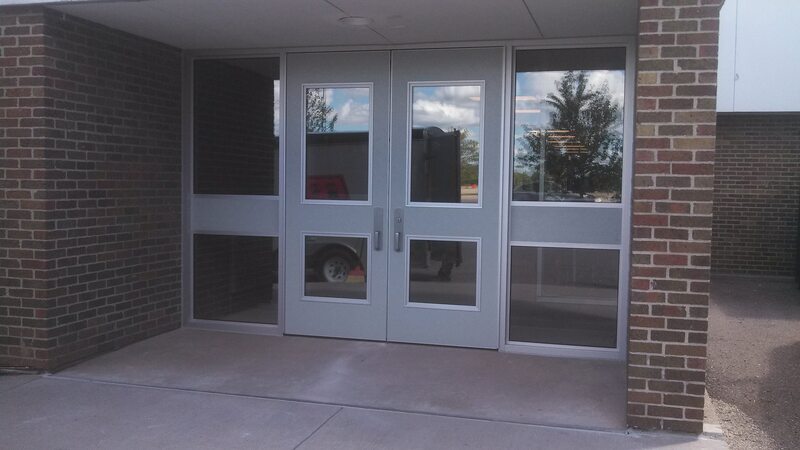 Retrofit your school entrance and add a vestibule for an added layer of door security to your school entrance. The main entrance of a school should be clearly marked and direct traffic through a secured vestibule that is visible from the main office where visitors are directed to walk through in order to gain entrance into the school. Perimeter doors should be limited, and locked at all times. Vestibules should be transparent for natural surveillance, and hollow metal window walls provide that surveillance and bolistic film can be added to the windows. Bullet proof glass can be added at a reception window for optimum protection. This is an example of a good design I found, published by the Texas Association for School Administrators.